You'll never miss a beat. Backbeater helps you keep steady time. Every time. Backbeater is the world's most advanced drum metronome. Backbeater consists of both hardware and software, and works with your smartphone or tablet. Musicians playing in a band often interpret tempo differently. Budding musicians and music students sometimes find it difficult to maintain tempo. Traditional metronomes can help address these challenges; however, they are often difficult to use, off-putting, and unnecessarily fiddly—not to mention expensive for what they attempt to accomplish. Here at Makers4Good, we figured there must be a better way. Our goal was to design a product that would correctly monitor tempo, display it clearly, and make it easy to use in the playing environments of modern drummers. By optimizing your mobile device’s large screen and interface, we’ve managed to make what we believe is a much better, clearer, cheaper, more sensitive, and more versatile product than those previously available. Best of all, Makers4Good donates its profits to charities, including music education charities. You get a great tempo monitoring system, and you help us help music educators and their students. 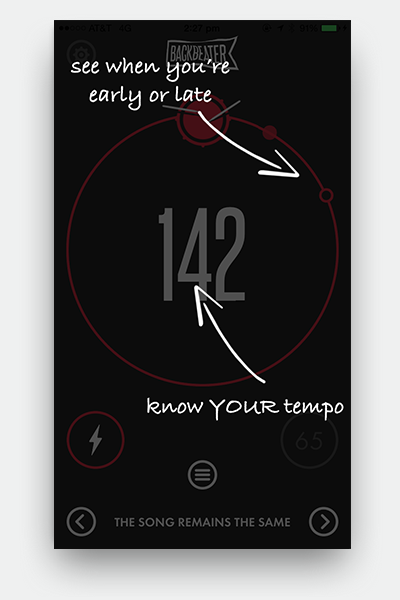 App Instructions: The Backbeater app will display your drumming tempo and alert you if you are too fast or too slow. Sensor and Mounting Bracket: The Sensor attaches to your drum with the Clip & measures your playing tempo. Wiretap: Connects the sensor and your headphones to the app at the same time. 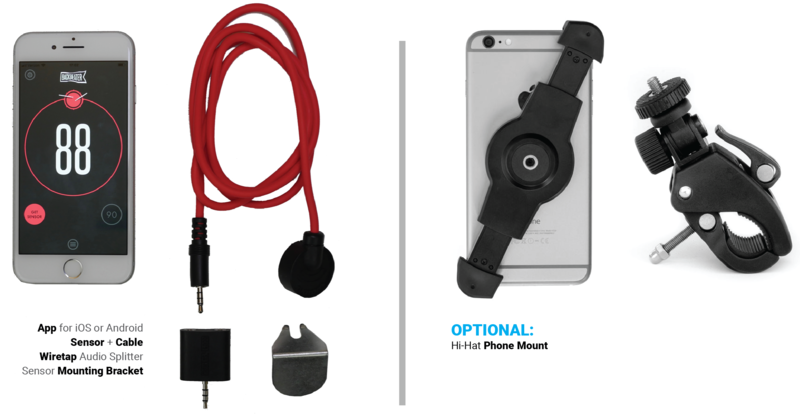 Hi-Hat Phone Mount: Available with our Backbeater Deluxe, the Hi-Hat Phone Mount allows you to mount your phone right where you can see it best while playing. Both parts of the Grifiti Nootle Universal Quick Release Pipe Clamp & Phone Mount (for 4.5” – 6.5” diagonal screens) have standard ¼-20 threaded connectors for maximum compatibility. Backbeater allows drummers to monitor their tempo: either freestyle, or with a reference tempo. The Backbeater metronome can be set to your rhythm. It can discreetly tell you a tempo you tap out, and it can store lists of tempos, for when you're playing live. Our tempo sensor mounts directly to your snare drum with existing hardware—it fits under one of the lugs that encircle your snare's rim. You simply mount and connect to your smartphone as follows. Mounting the sensor to your snare drum is easy, and requires no special equipment. Our app is easy to use, and shows you all you need to know about your tempo on one screen. This data is large and easily viewed while playing your kit. Drummers Love Backbeater—seasoned professionals, rock stars, and amateur drummers the world over love this app. I stumbled across your app...a gift from heaven for drummers. In the studio, or on stage, I never play without it. I waited my whole career for Backbeater. My son didn't practice before he got the Backbeater; now he's obsessed. It's an app for iOS and Android which allows drummers to monitor the tempo they're playing, accurately and easily. What do I need to get it to work? At a minimum you need the iOS or the Android app and the sensor. Consistent tempo is the fundamental skill of the percussionist. Ask any other musician what they value most in a drummer and they'll tell you it's their ability to stay in time. In a live setting many factors can affect the percussionist's ability to keep steady time. Adrenaline, lead-guitarists, flashing lights, smoke machines, screaming fans, oscillating fans. Once you have consistent tempo mastered you can concentrate on contributing to the song. But I'm a Professional Drummer with 37 years' experience. Do I need it? Plug it in, turn it on, play. We think you'll be surprised. I'm a total beginner, do I need it? Staying at a consistent BPM in all sorts of situations is a learned skill. The Backbeater will help train your brain to stay in time, at all times. The splitter allows the user to listen to the built-in metronome while using the system. It also allows the user to play along with tracks from their iPod while simultaneously monitoring their tempo. Cool huh? How does it monitor my tempo? The Backbeater app runs analysis on the signal input from the sensor, to register a strike when you hit the drum. It has been designed to find the moment of greatest attack amidst the broad-band snare noise and lock on to the backbeat tempo. Hence the name! It then does crazy mathematics to make sure it gives you output you can use. What do the "Window" and "Beat" settings do? 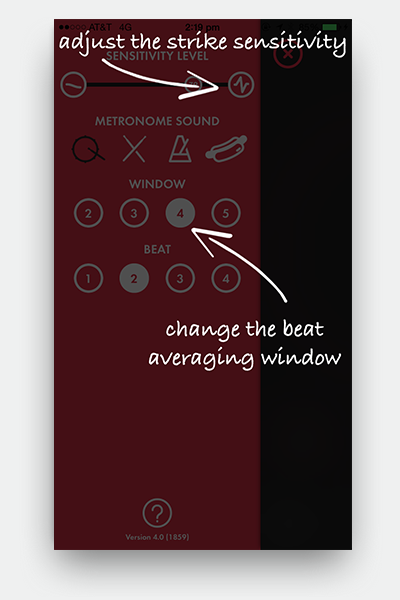 The "Window" setting specifies how precise you'd like the tempo monitoring to be. A setting of "4" will average out your speed over 4 snare strikes, so the the tempo reading is a bit more forgiving of tiny differences ion speed. A setting of "2" will do no averaging at all, so it will give you a more accurate—but less forgiving—reading. The setting you choose depends on your playing style, and on how interested you are in exacting measurement of your tempo. The "Beat" setting is a multiplier you might find useful if the beat you are playing is not a standard rock and roll beat. Say for example you are playing a relatively up-tempo song, but you are hitting the snare, specifically, slower than a rock drummer would. Your actual song's tempo might be 100BPM, but the reading on the app only says 50BPM. If you change the setting to "2," it will then correctly show you 100BPM while playing. You can program how sensitive it is to variations in your playing. The Backbeater App features a wide-range sensitivity adjustment control, so it works for Death Metal just as well as it does for Jazz. So there's an onboard Metronome? 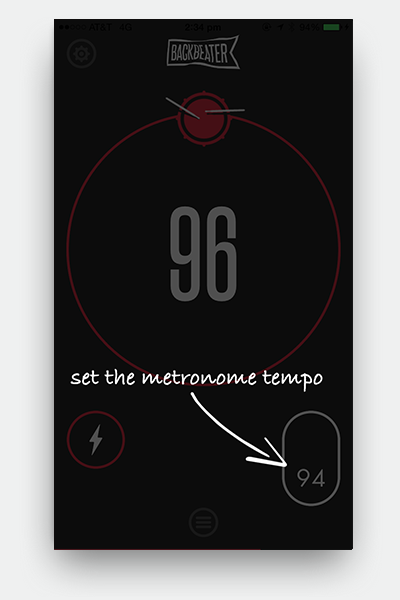 Yes, you can set the onboard metronome to play an audible click if you have the headphone splitter, and easily turn it off and on while you are playing. There are 3 sounds, Sticks, Clap, and Beep. It is programmable between 20 and 220 BPM. Apart from make you a truly brilliant drummer, and settling arguments with your bandmates, it serves as a metronome and a tempo monitor. That's all. We think that's pretty good though. However, we're working on some other really exciting functionality for future versions. Sign up for our mailing list (we won't spam you - we hate spam) or come back often. My iPhone doesn't have a headphone jack. Do you sell an adapter? We don't offer an adapter for that, but one does ship with your iPhone. If you have lost it, you can get one from Apple for $10. If it's our fault, send it back, we'll replace it. What if I'm a totally hard-core drummer and I start channeling Keith Moon and knock my hi-hat over in a Who-esque drum solo and my iPhone shatters into a thousand points of light? That is totally awesome, and may well be worth the hundreds of dollars it will cost you. Let there be no doubt you rock. But remember, part of the coolness of destroying your gear onstage is taking financial responsibility for it. This is totally amazingly brilliant. That's not a question, but we couldn't agree more.